Viola player Maxim Rysanov and pianist Ashley Wass gave the BBC Radio 3 Lunchtime Recital at the Wigmore Hall on Monday 14 March 2016, in which they played music Schubert plus contemporary refractions of Schubert's music by Leonid Desyatnikov and Sergey Akhunov. Rysanov's arrangement of Schubert's Sonatina in G minor D408 was followed by Desyatnikov's Wie der alte Leierman... and Akhunov's Erlkonig for viola and piano and the concert was completed with another contemporary work, Dobrinka Tabakova's Suite in Jazz Style. Having seen from the advance publicity that Rysanov and Ashley Wass would be playing Schubert, it was something of a relief to find them not playing the Arpeggione Sonata which always seems to be the Schubert of choice. Instead Rysanov had raided one of Schubert's violin sonatas. Schubert's Sonatina in G minor is one of a group which Schubert wrote in 1816; the title is his publisher's, Schubert called them sonatas. I have to confess that I don't know the work, so listening to Rysanov and Wass, I wasn't constantly comparing the differences in version, but Rysanov kept the original's key relationships. The opening movement started with a dramatic unison and then concerned itself with contrasts between the graceful and the dramatic. Schubert is generous here and his sonata form contains three memorable themes. From the opening notes were could appreciate the luxury pairing of Rysanov and Wass. Wass's refined piano playing complemented Rysanov and the two functioned is a fine partnership of equals. For the Andante slow movement we could appreciate the mellow beauty of Rysanov's playing, whilst the middle section had more sturm und drag though still with a nice sense of line from Rysanov. The minuet was very robust in character with vigorous playing from Rysanov and Wass, contrasting with the gracefully lyric trio. The finally was appealingly gracious too, though with its vigorous moments and a contrastingly perky second theme. Wie der alte Leiermann... (1997) by Leonid Desyatnikov (born 1955) takes the theme from Schubert's Winterreise and subjects it to a variety of transformations, effectively creating a set of fantasy variations though here the tone is bleak rather then celebratory. The work opened with solo viola, playing melody and accompaniment with the two open strings creating a strong hurdy-gurdy sound. At first this alternated with solo piano in a quietly mysterious refraction of the Schubert. This enabled us to appreciated the personalities of the two players, Rysanov all dark drama and Wass's beautifully crafted poise and magical tone. The two players finally came together in something of a meditation on the music. What followed was a series of quasi variations in which Desyatnikov took an aspect of Schubert's original and worked away at it obsessively. Each section was brilliantly characterised, but the overall tone was a sense of bleak fragmentation and unravelling, only to regroup for the next variation until at the end the whole thing fragmented totally into spare nothingness. A really terrific work, that formed the strong heart of a powerful recital. Erlkonig for viola and piano (2015) by Sergey Akhunov (born 1967) took fragments of Schubert's Erlkonig and threw them into a maelstrom of fast repetition. This started out quasi-minimalist with the fast repetitions containing interesting rhythmic motifs, but then the music got more violent, ending in terrific, intense moto perpetuo. 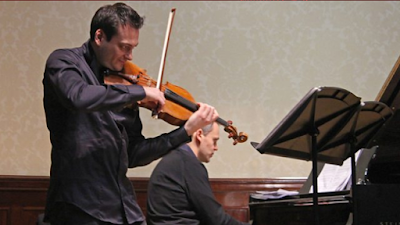 A real tour de force for both piano and viola. After all this dark intensity it was something of a relief to turn to the Suite in Jazz Style by the London-based Bulgarian composer Dobrinka Tabakova (born 1980). The suite was written for Maxim Rysanov as a BBC commission in 2008 when Rysanov was one of the BBC Radio 3 New Generation Artists. In the three movement suite Tabakova takes elements of jazz style that she admires and plays with it. This was no mere pastiche, though the jazz elements were recognisable you felt Tabakova taking the music as a starting point. The first movement was based around a stride bass in the LH of the piano, with the viola and piano RH exchanging jazzy instrumental riffs. Intriguing and rather catchy, the riffs formed a sort of starting point for Tabakova's musical excursions. In the middle movement we had an atmospheric piano introduction, with a lovely bluesy song on the viola. A large complex piece, it evoked the sounds and style of a smokey jazz singer, as Tabakova's music went beyond mere depiction towards meditation. The perky finale started with tapping on the piano, and then launched into a series of bright, uneven rhythms inspired by a cross-over between folk and jazz. A violent climax led to something more contemplative before the opening material returned. The suite formed and appealing and intelligent conclusion to a highly satisfying, and remarkably imaginative recital. The recital is available on BBC iPlayer for 30 days.